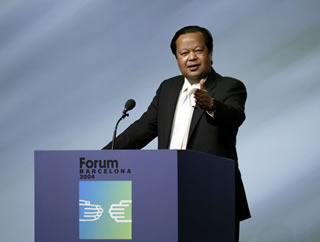 On June 14, Prem Rawat, known also as Maharaji, addressed an audience of more than 2,000 at an event endorsed by the Universal Forum of Cultures. The Forum, expected to attract 5 million visitors over 141 days, promotes three themes: cultural diversity, sustainable development, conditions for peace. Attended by many world leaders, it consists of conferences and congresses and is geared toward reflection.